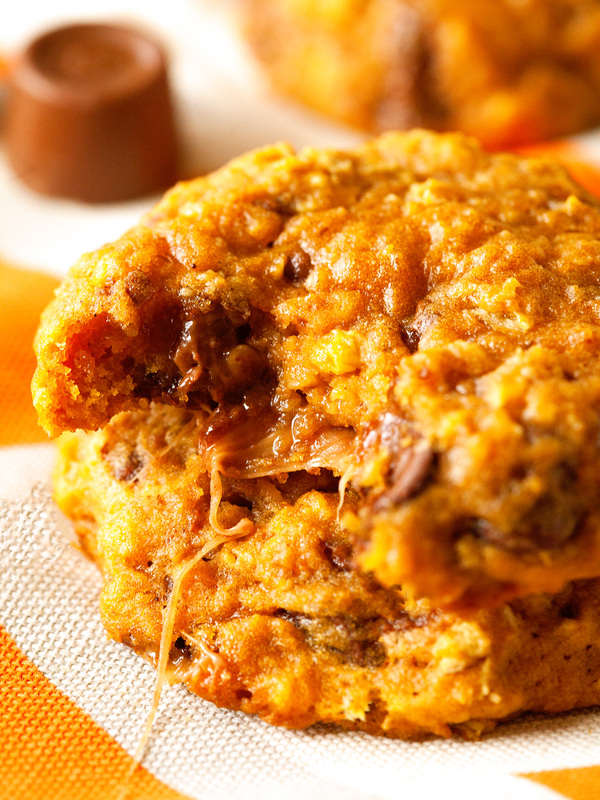 Super soft and chewy Oatmeal Pumpkin Cookies stuffed with Caramel. Fall baking doesn’t get much better! Welcome to another week! Did you have a good weekend? Mine is pretty much summarized by these cookies. Cookies are my ultimate comfort food, especially when they come with plenty of chocolate chips, caramel and the awesomeness of pumpkin. I worked hard on these, friends. I have had my fair share of cakey pumpkin cookies, which isn’t necessarily a negative thing. While they can be just as delicious, I wanted a pumpkin cookie that tastes just like a cookie should. Complete with crispy edges, ultimate chewiness and zero disappointment. And after perfecting THE pumpkin cookie recipe, I couldn’t help but add ooey gooey caramel to each one. I thought it couldn’t get much better, but the addition of caramel definitely stepped things up. 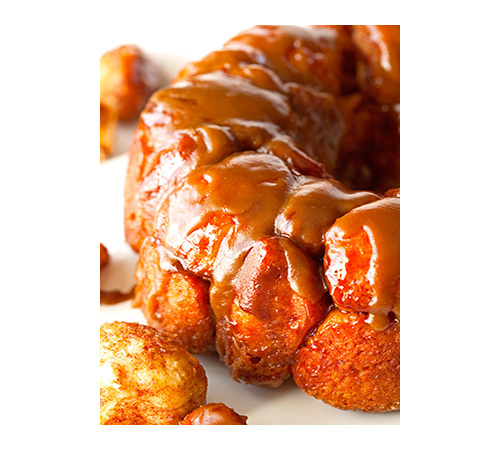 Once you go caramel stuffed there’s no going back. I may never make “regular” cookies again. Even though we’re just getting started with the fall recipes, I can confidently say that if I had to choose only one thing to make this season, this recipe would be it. I could eat these cookies week after week and never grow tired of them. On the contrary, the more I eat these cookies, the harder it is to stay away from the cookie jar. And that’s precisely the reason why. The dough does require some chill time in the fridge before baking the cookies. It’s essential for enveloping the caramels with the dough and making sure that it doesn’t leak while baking, i.e. to avoid a caramelly mess on your baking sheets. If you’re short on time, you could skip the caramel step (and therefore the chill time) and simply make amazing Oatmeal Pumpkin Cookies. 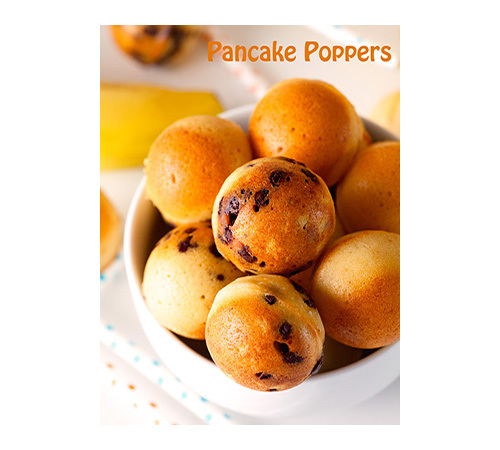 They’re filled with chocolate chips and toffee, btw. This makes for an excellent base recipe and they’re still extremely delicious. This is why I love fall so much. Good thing we’re just getting started, I need all the time I can get to chow down on these. Yep, you should most definitely give them a go! Have an amazing start to your week! These cookies have it all. 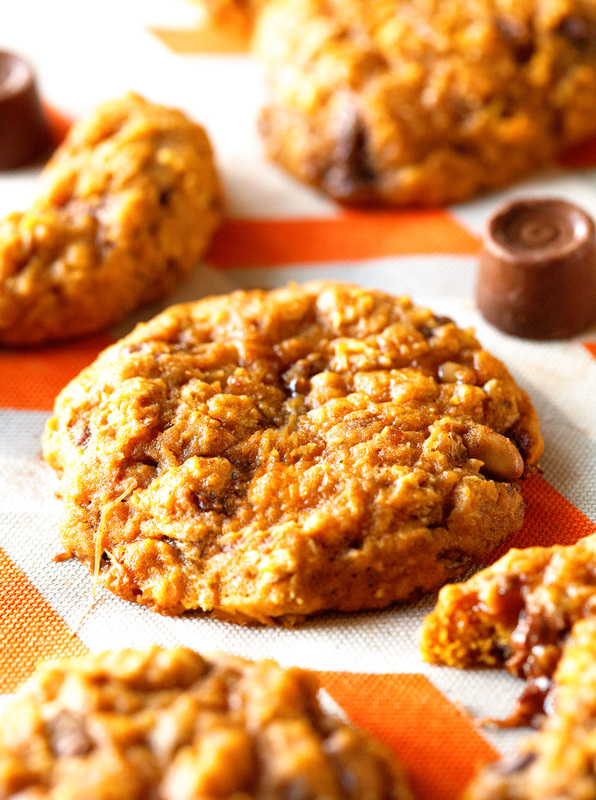 Fall into fall with these scrumptious cookies. You won't be sorry! 1. In the bowl of your stand mixer, cream together butter and sugars until light and fluffy. Mix in egg, vanilla, and pumpkin. Add baking soda, salt, and pumpkin pie spice and stir until incorporated. Finally add flour and oats and stir until combined. Fold in chocolate chips and toffee bits. Cover bowl and refrigerate for 2 hours or until ready to use. 2. Line a baking sheet with parchment paper. Preheat oven to 350 degrees F and unroll Rolo candies from their wrappers. Using a large cookies scoop (about 3 tablespoons), scoop cookie dough onto prepared baking sheet. 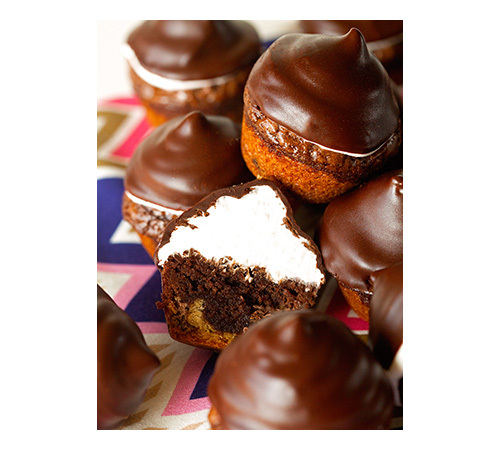 Enclose one Rolo candy with one dough ball and cover completely. 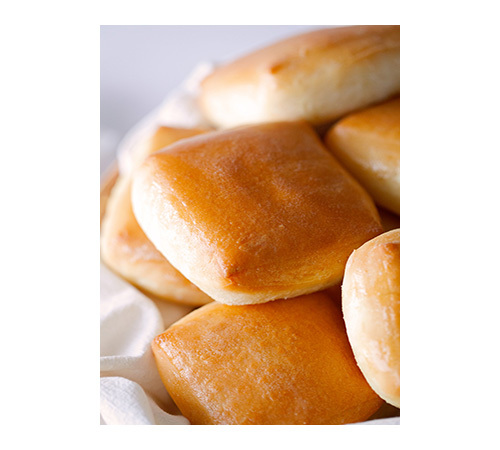 Roll into a ball and return to the baking sheet. Repeat. Bake for 12-14 minutes or until lightly browned. Let cool on baking sheet for 10 minutes before moving to wire racks to cool completely. 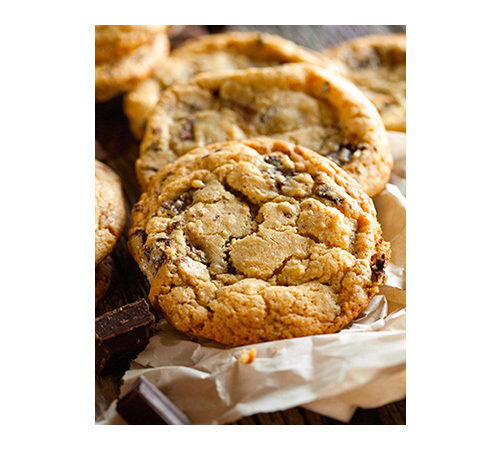 Cookies will keep up to 5 days stored in an airtight container or up to 4 weeks in the freezer. 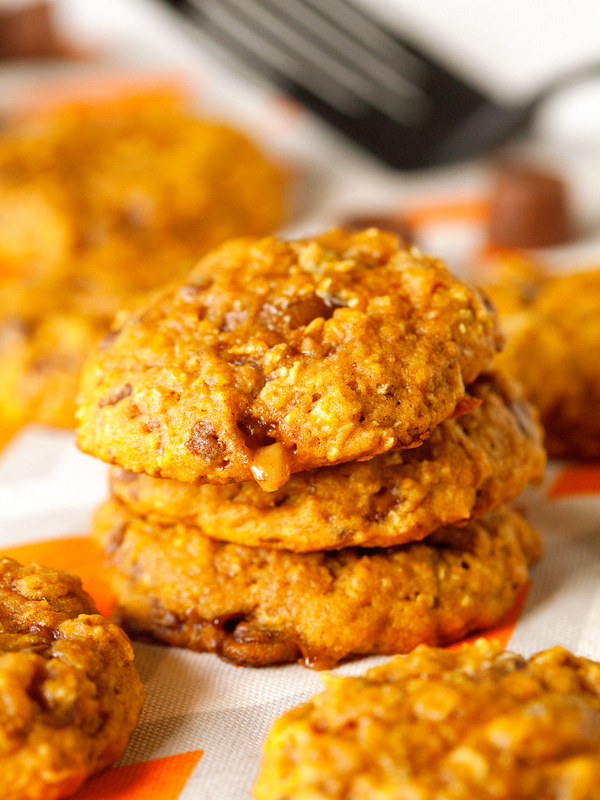 Caramel stuffed oatmeal cookies?! Amazing, Kathi! I’m seriously drooling over your pictures. Such a creative way to jazz up a plain oatmeal cookie! Thank you so much, Gayle. These are definitely my fall favorite! I wish you were too! I have so many goodies to share ;). Thank you. Xoxo. Chocolate chips, toffee bits, and Rolo candies? That is my kind of oatmeal cookie! 🙂 And of course I love how you jazzed them up for fall with the pumpkin flavors, too! Thank you so much, Meggan. I love jazzing up my cookies! Oh my goodness…caramel stuffed? 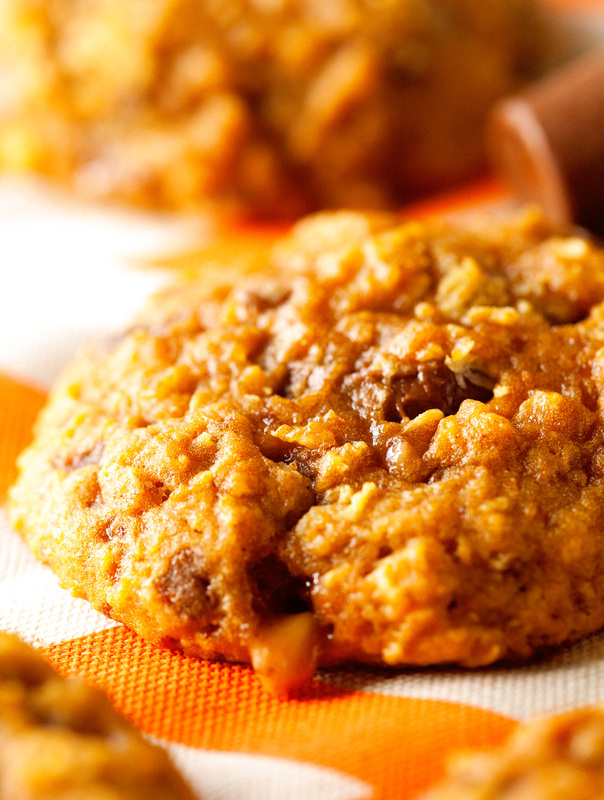 Could these oatmeal pumpkin cookies get any better? They look absolutely delicious! Thank you, Phi! You are so sweet! Oh these sound like one would not do. I would probably need about 10 with a glass of milk. Yummy!!! 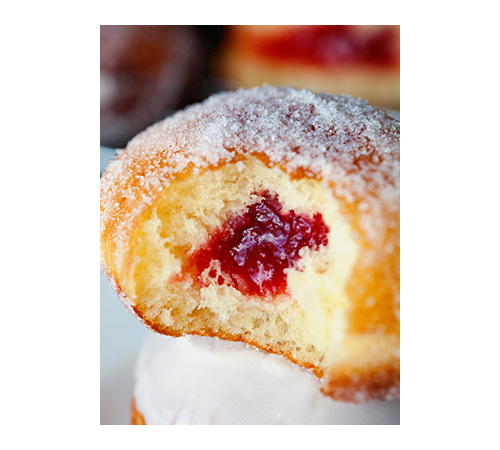 You seriously won’t be able to stop at just one… 10 is mandatory ;). Thank you, Kathy! 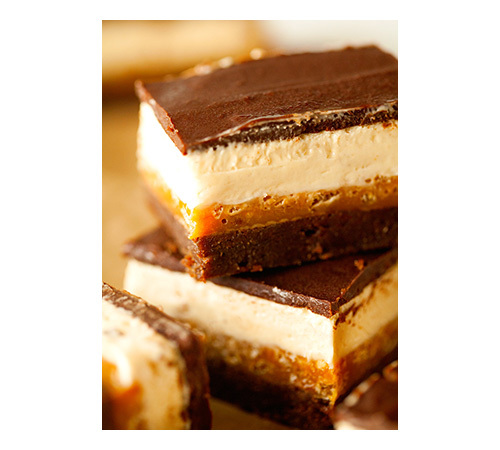 Someone said caramel – i’m there! These look amazing!!!! 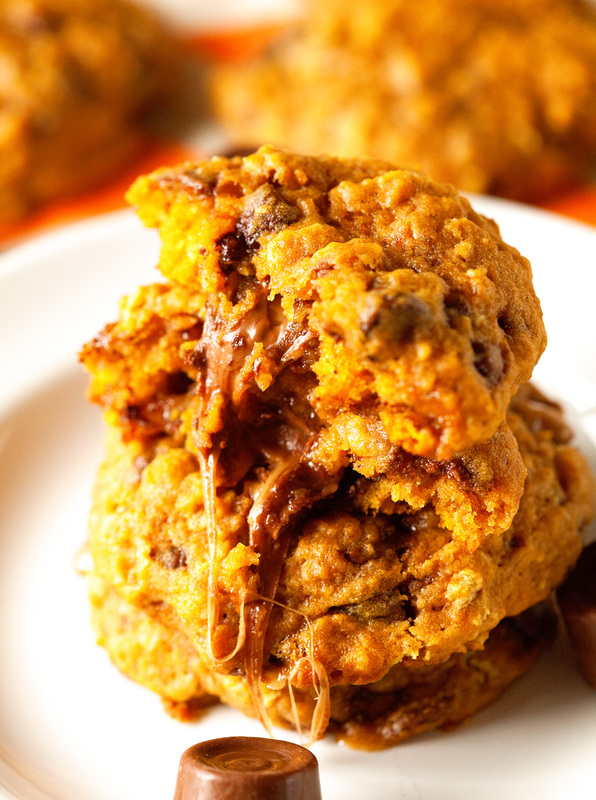 I’ve never had a pumpkin cookie before but these are very tempting! I feel the same way about caramel ;). Thank you so much, Jess! 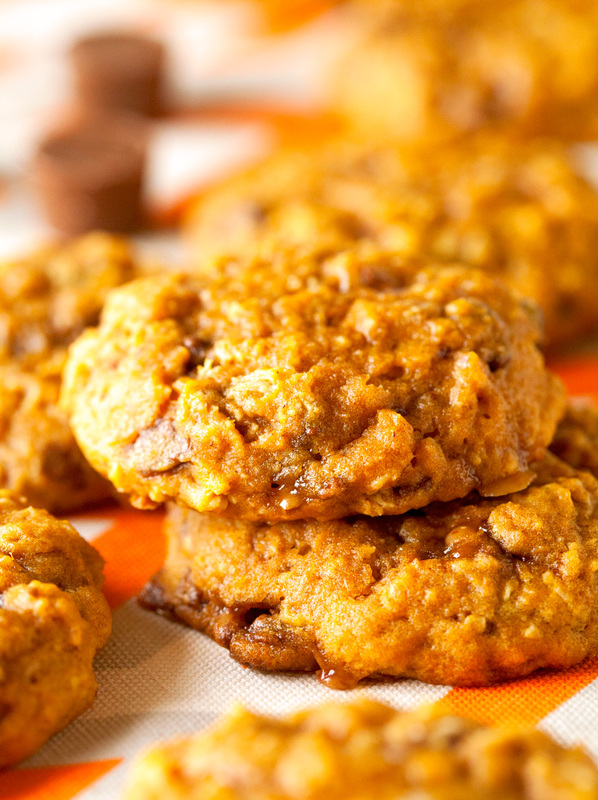 Pumpkin cookies sound great, but stuffing them with caramel can only make them better! YUM! Stuffing them with caramel definitely sets these cookies over the top! Thank you so much!! 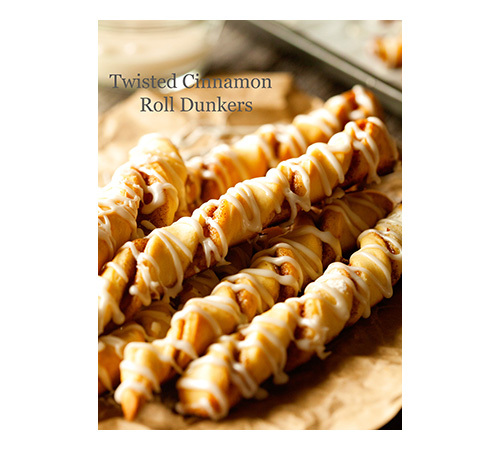 Once you go caramel stuffed, you never go back. You crack me up! And those are such true words. These look amazing. I’m always blown away by your desserts and just when I think they can’t get any better! Awww, thank you, Leah! You are so, so sweet! Ohhh baby! Caramel stuffed anything. AND with pumpkin. Great, creative cookie! 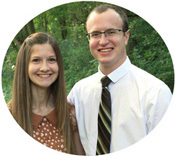 Reading your blog makes me think of MN. Miss it already. Thanks for the recipe, Kathi 🙂 Hope you’re having a wonderful Fall so far! Thanks, Kelly! I am glad I can send you some MN love from my blog. It looks like you’re having a great time getting acclimated to your new NYC home ;). XOXO! Thanks a lot for this recipe. They look seriously good. I may have to keep the cookie jar away from my sons’ reach when I make these cookies, though. Haha. Ha! Definitely, Joshua! Thank you so much! Oh my goodness! You make the best treats! 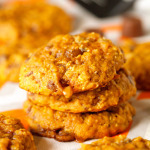 Love that you stuffed pumpkin oatmeal cookies with caramel! That oozy caramel shot is gorgeous!